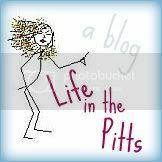 Life in the Pitts: Ooh! haha i was going to say something about you living under a rock, but i finished reading your post and nevah-mind. =) I got the expression for christmas and just opened it a few weeks ago. LOVE IT!!! now its cartridge collection time! I want one too, can you say vinyl lettering? I have the Cricut (small one) and the Silhouette. You may not know that I own pretty much everything there is. i do love the Cricut. The Silhouette is a little too complicated for my simple minded self. I want to upgrade to the big Cricut someday. dont worry i just found out about it a couple of months ago! Oh honey..... I'm sorry I haven't shared the love with you sooner! Check out SCAL (http://www.craftedge.com/purchase/purchase.html), which I've asked for for Christmas. And I've got the Design Software, which is FANTABULOUS. Also, never buy anything at full price. EBAY!!! I never pay more than $20 for any cart.